With a flawless performance from start to finish, Virgin Islands sailor Taylor Canfield, 24, did not lose a race today en route to a dominating victory in the fifth running of the Budget Marine Match Racing Cup. Canfield and his crew - four-time Canadian Olympian Richard Clarke, and accomplished Caribbean sailor Mark Plaxton - went undefeated in seven races during the early round-robin qualifying tournament, and then dispatched fellow Virgin Islander Cy Thompson in two straight races in the best-of-three finals to earn the winner's purse of US$5,000. Runner-up Thompson took the second-place prize of US$2,000. 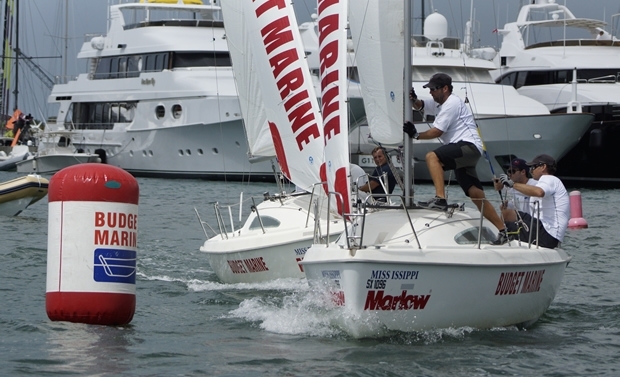 In the petit final, last year's Budget Marine Match Racing champion Colin Rathbun of the BVI beat Russian Eugeny Nikiforov to earn the third-place check of US$1,000. The fifth edition of the event, which kicks off a festival of sailing culminating with the 33rd St Maarten Heineken Regatta, attracted the strongest fleet of match racers in the series growing history. The eight skippers included Ukrainian sailor Rodion Luka, the 2004 Olympic 49er silver medalist; professional sailor Anthony 'Tonks' Kotoun, another Virgin Islander; Lorenz Mueller of Switzerland; and Thomas Mallindine from the UK. The event was contested in identical 20ft Jeanneau SunFast sloops in shifty, challenging winds ranging from 8-18 knots in the Simpson Bay lagoon. However, despite the world-class field of competitors, the day belonged to Canfield, the former Boston College star who is currently ranked 8th in the ISAF Match Race Rankings and serves as Director of the Chicago Match Race Center. "I've been match racing for six or seven years now, so I'm getting accustomed to it," Canfield said. "I usually got off the line pretty well, hit the shifts and stayed in the puffs. My crew did a great job of keeping me in phase and the rest was easy from there." "It was nice sailing with the kid," said Clarke. "I was just trying to keep up with him and not slow him down." "A bunch of guys-Anthony Kotoun and Cy Thompson-were from my hometown (St Thomas)," said Canfield. "So that kind of rekindled a flame. I grew up sailing with Cy, and went to school with him. So it was cool to sail in the finals together with my best buddy. There were just a lot of good guys out there. And the conditions were very unique (in Simpson Bay). You've got the mountain that the wind drops down off of so it's very shifty and squirrely. You have to make the best of the situation when you're behind and keep fighting because there's always lanes for passing." Maybe then Canfield will actually lose a race in the Budget Marine Match Racing Cup. But as he proved on the race course today, you might not wish to bet against him.